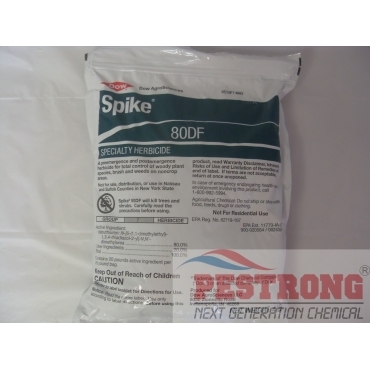 Where to Buy Spike 80DF Herbicide, Spike 80DF Pasture Herbicide - 4 Lb - $102.95 for Sale with Fast Free Shipping! 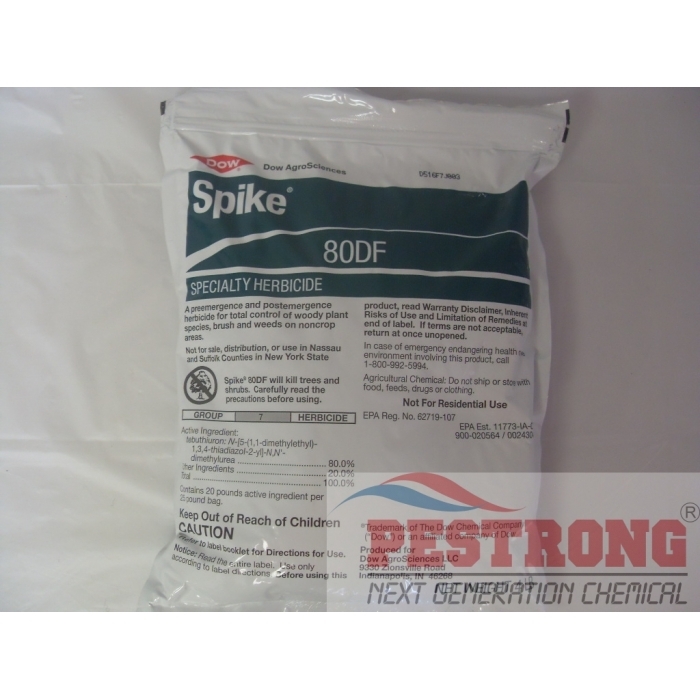 Spike 80DF Pasture Herbicide - 4 Lb is a dry-flowable formulation as Pre-emergent and Post-emergent Pature Herbicide that is mixed and applied with a water carrier. Tyvek Coveralls Disposable Spray Suit with..
A soil-active product, Spike 80DF is applied to the soil surface by ground equipment and enters plants only through the roots. Spike 80DF has active ingredient (tebuthiuron 80%), a formulation applied as a dry-flowable dust. If you want to pellet formulation, use Spike 20P. Spike 80DF herbicide is mixed with water and applied directly to the soil surface in a concentrated, narrow, straight stream (band). There, the solution enters the soil profile to intersect with the lateral roots of woody plants. Precise, banded applications of Spike 80DF herbicide are perfect for clearing susceptible brush from fencerows, to create openings for wildlife habitat, or to spot-treat brush motts (small groves or clumps of brush) to improve grazing. Spike 80DF helps fight fires in more ways than one. Firebreaks created with Spike 80DF not only help slow down wildfires, they also provide access points for fire personnel, as well as areas for safety and parking emergency vehicles. To create herbicidal firebreaks, apply Spike 80DF herbicide from midsummer to early fall. Use truck- or tractor-mounted equipment. A spray boom with low-pressure, large droplet nozzles should be adjusted to deliver a uniform strip about 40 to 50 feet wide. Depending on application rate, one application can provide effective control for two years or more. For more information on establishing rangeland firebreaks with Spike 80DF herbicide. *Be careful spike 80DF will kill tree and shrubs. First i dont know how to use this kind of stuff so i read online which I have to mix and apply to the root system. It acts fast and it has no nonsense chemical. it works great!!! Very nice pre and post emergent, applied to soils and then absorbed through the root of the plant, controls oaks especially well, it is a purchase you won't regret.